Aerial view taken on October 17, 2011 of a green and brown stain at sea off the coast of the village of La Restinga on the Spanish Canary Island of El Hierro. MADRID, Spain – Spain’s National Geographical Institute says the Canary Island of El Hierro has been rocked by more than 50 tremors in 24 hours, two years after a new volcano began to appear off its southern coast. So far the resurgent seismic activity has caused no damage, a regional government spokeswoman said Monday. She spoke on condition of anonymity because she was not authorized to be identified in the media. The last time the nascent volcano rattled the island the government evacuated the port of La Restinga, banned aircraft from flying over the southern tip and ordered ships to avoid the area. At one point residents could see smouldering volcanic rocks spewing from the sea. 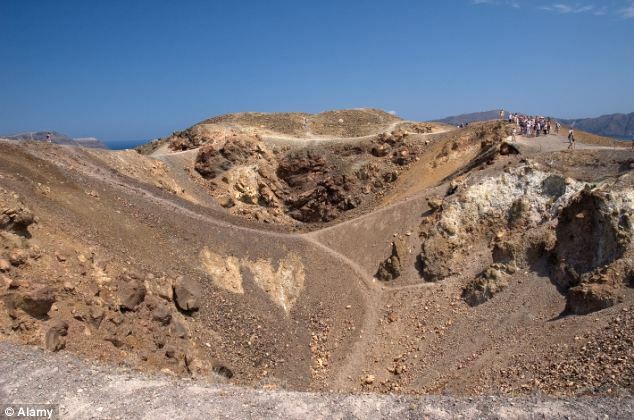 El Hierro has some 11,000 residents and was originally formed by volcanic activity. A brand new island created by volcanic explosion is quickly growing and will likely remain a fixture of the Pacific landscape, Japan’s Meteorological Agency said on Thursday. The island was formed from lava that cooled and hardened above sea level after a large underwater volcano began erupting in late November. While it is quite rare for new islands to spring up out of the sea, instances of major volcanic eruptions—especially for 2013—are becoming commonplace. In fact, 2013 will go down in history as the year with the most volcanic eruptions since record keeping began. A University of Utah seismologist analyzed seismic waves that bombarded Earth’s core, and believes he got a look at the earliest roots of Earth’s most cataclysmic kind of volcanic eruption. But don’t worry. He says it won’t happen for perhaps 200 million years. “What we may be detecting is the start of one of these large eruptive events that – if it ever happens – could cause very massive destruction on Earth,” says seismologist Michael Thorne, the study’s principal author and an assistant professor of geology and geophysics at the University of Utah. But disaster is “not imminent,” he adds, “This is the type of mechanism that may generate massive plume eruptions, but on the timescale of 100 million to 200 million years from now. So don’t cancel your cruises.” This map shows Earth’s surface superimposed on a depiction of what a new University of Utah study indicates is happening 1,800 miles deep at the boundary between Earth’s warm, rocky mantle and its liquid outer core. Using seismic waves the probe Earth’s deep interior, seismologist Michael Thorne found evidence that two continent-sized piles of rock are colliding as they move atop the core. The merger process isn’t yet complete, so there is a depression or hole between the merging piles. But in that hole, a Florida-sized blob of partly molten rock – called a “mega ultra low velocity zone” – is forming from the collision of smaller blobs on the edges of the continent-sized piles. 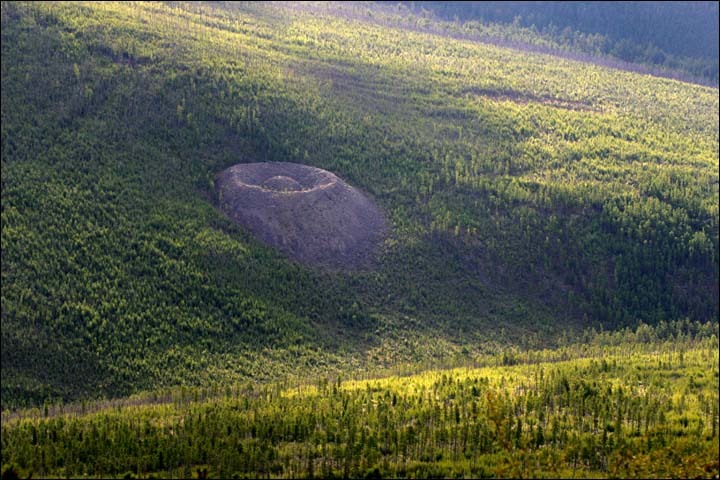 Thorne believe this process is the beginning stage of massive volcanic eruptions that won’t occur for another 100 million to 2100 million years. BANDUNG, Indonesia — Three active volcanoes in Indonesia’s North Sulawesi and another one in North Maluku are rumbling due to the impacts of the recent major earthquake in the neighbouring Philippines, the head of the Vulcanology and Disaster Mitigation Agency, Surono, said Thursday. “All four volcanoes are on alert status now,” Surono said in Bandung. The three rumbling mountains in North Sulawesi are Mount Soputan in Southeast Minahasa, Mt. Lokon in Tomohon and Mt. Karangetang in the northern part of North Sulawesi, while Mt. Gamalama in Ternate Island grumbled in North Maluku. Surono explained that the four volcanoes, which were located in one area, had rising levels of activity due to the impact of the Philippine earthquake. Ash spewed from Mt. Soputan, for example, has been blown by the wind to Bitung. The volcanic ash was released by a volcanic explosion early on Tuesday morning, Surono said. “The explosion on the mountain took place until 2 a.m.,” he added. 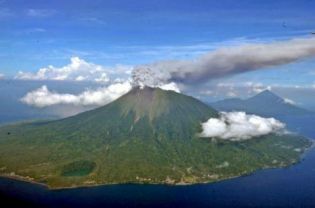 The government’s emergency response system (SINAPRED) is maintaining a state of preventive alert in the northwestern departments of Chinandega and León after San Cristóbal Volcano erupted Saturday morning. A giant ‘balloon of magma’ is inflating under the volcanic Greek island of Santorini, warns a new study. The balloon is so big it has forced the island upwards by 14cm between January 2011 and April this year. It has also triggered a series of small earthquakes, the first seismic activity in 25 years – raising fears that the volcano could erupt for the first time since 1950. The chamber of molten rock beneath the volcano has expanded 10 to 20 million cubic metres – up to 15 times the size of London’s Olympic Stadium – between the time – according to a survey conducted by a team led by Oxford University scientists.